This Mortal Coil is an outdoor installation in the Terrace exhibition space at the Urban Institute for Contemporary Arts. 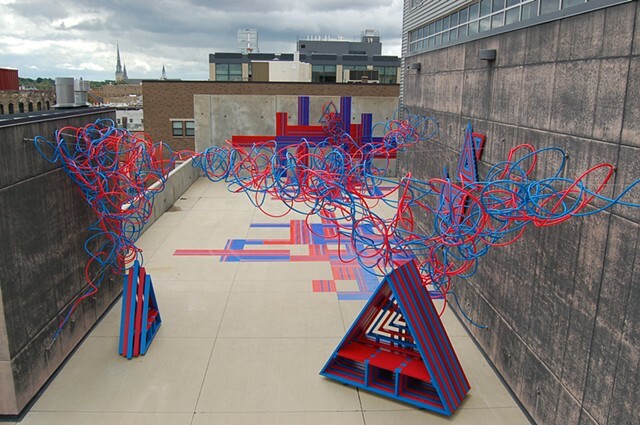 Painted wooden structures intermingle with large tangles of red and blue PEX (cross-linked polyethylene). Grids made from sign vinyl and tape create a backdrop of vibrating red and blue stripes. The juxtaposition of vivid red and blue creates strong color vibration. The concepts used to explain this optical effect—simultaneous contrast, retinal fatigue, and afterimage—rely on our understanding of struggle to illustrate what are actually chemical reactions occurring in the brain. The contrasting colors and their afterimages are described as fighting for dominance, which creates the sensation of vibration. The concept of desire is utilized as well; we describe the eye as “wanting to rest”, or “wanting to see the opposite color”. Strong emotional language is necessary to explain a phenomenon that challenges our perception of reality.